40V 16 IN. MOWER is rated 4.7 out of 5 by 251. Rated 4 out of 5 by lawndude84 from Nice little mower I have owned this mower for 2 years now and it still works good. The bagging feature is kinda useless for my yard, the bag fills up rapidly and I would need to empty it 40 times to mow my 1/3 acre yard. The mulching mode with the bag detached seems to work good, so that's how I roll. If the lawn gets a boost from fertilizer or I miss a week mowing, I need to borrow a gas mower to get it back in line. This mower just does not have the power needed to handle long lush grass. I have 3 of the 2 amp-hr batteries, and it takes all 3 to do the entire lawn. I wish there was a trade in program so I could upgrade to the brushless 20" mower. Rated 4 out of 5 by Jorge17 from Never going back to gas, battery notoncluded :( I bought this in the middle of mowing season to this year. Since it did not include a 40V battery and Homedepot does not sell those battery as a stand alone item. My only choice was to buy an electric weed eater with a 40V battery to use on the mower. I would have rated this mower with 5 stars if it had and optional side discharge and included a battery. 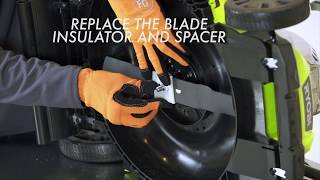 Over all great mower for the price and adjustable cutting lengths is very convenient. Advise for first time buyers; definitely spend the extra money on purchasing a mower that includes 2 batteries this will eliminate down time while waiting on battery to charge. Rated 5 out of 5 by hoodrider from So easy I will actually mow my own lawn now!!! I've struggled with regular lawn mowers because I'm too short to get enough leverage to start them and I'm not strong enough to bully them around my tiny yard. I decided to give this a try and I'm utterly in love! I have no trouble starting it and I can move it around with hardly any effort. I managed to finish my front yard in under 20 minutes on only 1/4 of the battery charge! And I even could fold it up and put it away without any trouble at all. I would recommend this for anyone but especially someone who isn't overly strong or tall. I'm actually looking forward to mowing my own lawn instead of paying someone to do it for me! Rated 4 out of 5 by cmartin from Excellent battery life, light weight mower This mower is great for a smaller yard. I have a city lot that is around 0.1 acre and I can mow it twice on one charge. A charge lasts about 40 minutes of mowing. The height adjustment lever is perfect. The smaller size of the mower is good for my smaller yard with tight corners. The mower is very light weight and easy to push. My biggest complaint is the quick release levers for the folding handles. The lower ones are a little awkward to use and don't work that well. Also, the clips that hold the cable to the handle aren't great. Mine pop off very easily. I will likely zip tie them. Rated 5 out of 5 by 9marathonpaul from Powerful What a breeze to use this 16-inch mower. I chose the 16-inch over the 20-inch and find I can get into a lot of corners of my property. I can cut the front lawn in the late morning and do some sidewalk edging too on one charge. Then, I charge the 40 volt battery while having lunch or making a few phone calls. At age 69 with arthritis in my right hand...no more hard pulling to start and no more gas and oil to fool with. 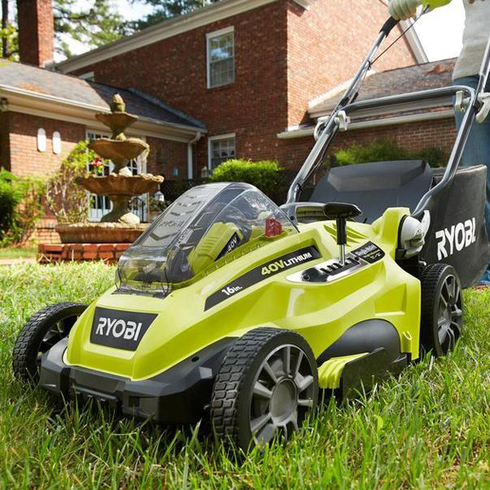 I love this Ryobi lawn mower. I also bought the weed eater/edger and the 24-inch hedge trimmer- all 3 are TERRIFIC products. Rated 5 out of 5 by HappyWeSwitched from Vast Improvement Over Self Propelled Model We just bought a "lawn package" from Home Depot that consisting of the 16" mower, string trimmer, charger and battery when the charger for our old, Self Propelled model appeared to fail. This unit is MUCH more maneuverable and the bag is positioned high enough to clear most raised objects around our yard when backing up to start a new row; something the self propelled model couldn't do. It's nice and light and the bag fits snugly against the outlet chute so my wife said she'd like start mowing the grass more! Another "accidental" benefit!!! If it's built as well as our self propelled model, I know where in for YEARS of reliable service! Rated 5 out of 5 by Phx_ from Makes Mowing Fun! This mower is lightweight, easy to start, super easy to maneuver, and powerful too. My first mow of the season had some thick clumps of grass that were 8-10 inches high. I slowed down a bit, and this mower went right through them! I finished my quarter-acre yard with half the battery charge to spare. Using this mower felt more like playing than working, so I literally found myself looking for more grass to cut! I also love it that you can fold the handle, easily pick it up by the carry handle, and neatly tuck it into storage -- saves so much space compared to my old gas model. And women, this one is Highly Recommended for you! 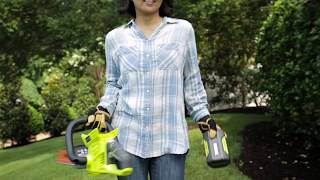 Ryobi takes cordless to the next level with the Ryobi 40-Volt 16 in. Lithium-Ion Cordless Lawn Mower. This lightweight and compact mower features a 16 in. 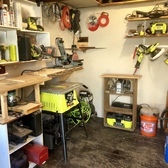 cutting deck and foldable handles for compact storage. The 4.0 Amp Hour High Capacity 40-Volt Lithium-ion batteries deliver fade-free power and extended run time. With hassle free push button start and single point height adjustment, this quiet mower is the perfect solution for any small yard. This mower is mulching and bagging capable for user convenience. Best of all, this mower is backed by the outstanding Ryobi 40-Volt 5-year limited warranty.